I made a quick trip around the ‘Net this morning to see what I could see and wished I hadn’t. There seems to be an endless supply of people who endeavor to teach God’s Word, but unfortunately, also seem to have little clue about many things. They fail at using any type of context (historical, grammatical, or otherwise), to rightly interpret Scripture. Beyond this, they all seem to enjoy setting dates about the Lord’s return, the start of the Tribulation, the end of the Tribulation, where we are in the Tribulation and much more. I think it’s clear from Daniel 9:27 alone that the actual Tribulation does not begin until a covenant is brokered by the Antichrist with Israel and the surrounding nations. Then again, there are those people who believe the entirety of Daniel 9 has already been fulfilled so that’s all in our past. I would disagree with them because of other portions of Scripture that also speak to the Tribulation and the final “week” (seven years) of human history prior to the physical return of Jesus to this earth. Frankly, I don’t understand it. Yes, I do understand what Jesus has stated about the times of the end that lead up to the start of the Tribulation, the Tribulation itself and the times as they will be just prior to His physical return (Matthew 24). He seems to make things pretty clear, but goodness, maybe I’m missing things. I don’t understand how people can make such grievous mistakes when it comes to interpreting God’s Word. I’m not trying to sound arrogant because I don’t know everything about His Word either, but there are individuals who are so mistaken in their understanding of Holy Writ that it is a bit embarrassing to even discuss their multitude of errors. Apparently, Dewey Bruton is an individual who has become rather well-known in the end times arena. Who knew? He has a very specific articulated timeline for Daniel as it relates to the end times. I completely disagree with it as do many others, but that doesn’t really matter because Bruton has a large following of people who latch onto every word he has taught. Here’s just one example of the reception Bruton’s teachings have received. The trouble is that his exegetical prowess appears to be seriously lacking. I’m trying to be charitable here. Bruton’s errors jump out at me like a shark jumping out of the water after prey. But to others, the “mysteries” that Bruton has revealed have made him a folk hero among certain end times groups. It is almost pointless discussing these things because people have such adamant opinions about them that they cannot discuss end times events civilly. Here’s one site that proves my point. Scroll to the bottom and read the comments. According to Bruton’s own teachings, he believes we are done with the Tribulation. In fact, the mid-point of said Tribulation was apparently March 21, 2013 and Jesus was slated to return yesterday, October 17, 2016. Unless I slept through it, I did not see Jesus returning to earth, did you? In Matthew 24:30, Jesus refers to the sign of His own coming, which is that as the lightning flashes from the east to the west. His return will literally light up the sky and everyone on earth will witness the event of His physical return. Revelation 1:7 tells us that when He returns, every eye will see Him. Did you see His return? Yet, Dewey Bruton teaches that Jesus was to return yesterday. Did you happen to see it? I didn’t. In fact, nothing changed. The world continues to move toward the end of this age. Generally speaking, the term “prophet” refers to someone who can accurately predict the future. True prophets do not make mistakes because they are simply repeating what God has told them to share. It’s really that simple and we see this occurring in the Bible repeatedly. Yet, we have the Steve Fletchers, the Dewey Brutons, the Harold Campings, and too many others to list here who, for one reason or another, speak authoritatively about things that simply do not come true. Camping failed three times to predict when Jesus was physically going to return to the earth. He failed three times. I believe it was in response to those failures that he had a stroke, lost his voice, and eventually passed onto eternity. Steve Fletcher as well has made so many errors and false claims that it would make great fodder for a TV situation comedy, sadly. Yet people continue to believe him and others like him. One of the latest claims by Fletcher is a doozy. Last year he predicted that Rabbi Jonathan Cahn would be murdered by President Obama. But wait, there’s more! Cahn would then rise from the dead! But wait, there’s still more! After being murdered and raised from the dead, Cahn will be raptured! If you care to do so, you can read about it here. People are allowed to have different opinions. The problem comes in when people become vitriolic toward others who do not hold to their particular opinion. That creates problems and rather than engender true love and compassion in spite of differences, those differences produce anger and hostility. The other problem occurs when people fail to accurately handle the Word of God and when that happens it’s usually because they do not allow Scripture to interpret Scripture. I find it fascinating that people like Steve Fletcher, Dewey Bruton, Harold Camping, and too many others have a following at all though I realize I shouldn’t be surprised. People are always drawn to “new” things, whether it’s allegedly the Spirit of God doing “something new” connected to some ethereal experience or God allegedly giving someone insight into some “new” understanding of age-old Scriptures. People seem so desperate to want to “know” the whens and the whys that they surround themselves with teachers who are willing to do just that even if what they’re teaching doesn’t make any sense at all. Does that sound familiar? For the time will come when they will not endure sound doctrine; but after their own lusts shall they heap to themselves teachers, having itching ears (2 Timothy 4:3; KJV). The “itching ears” paints a vivid picture of someone who deliberately seeks out people who preach what he/she wants to hear. It perfectly describes people who are “soulish” in their pursuits. If the teaching “resonates” within them, they will buy into it. If they have to apply their intellect to it, these folks tend to ignore it. 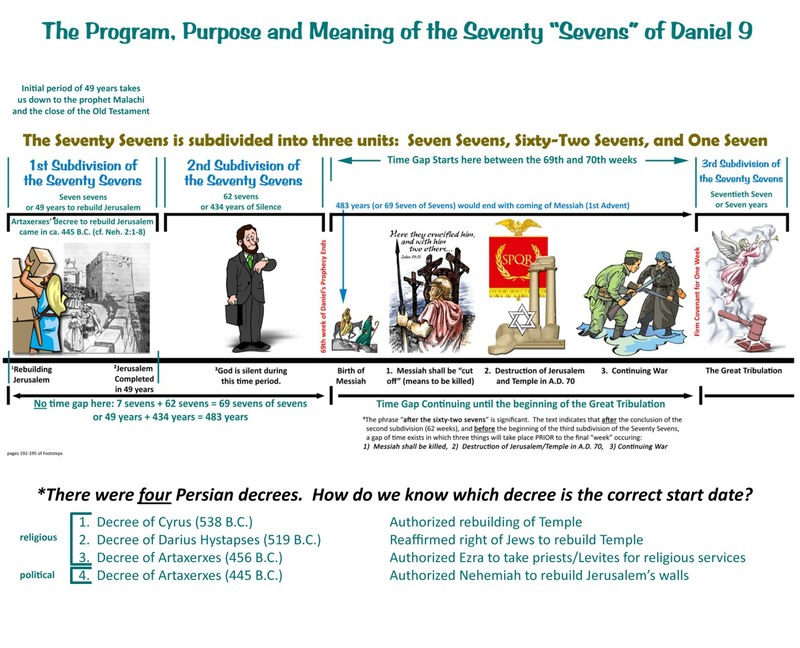 A perfect example is of the “Daniel’s Timeline” Dewey Bruton created that he says is the truth about Daniel 9:24-27. It certainly looks authoritative, doesn’t it? It’s complex, uses terms that many might not be familiar with, seems to make sense, and looks professional. Unfortunately, the timing is way off because of where Bruton begins the timeline. He essentially made the starting point when the UN decreed Israel would become a state again (1947). It simply doesn’t work for a number of reasons. He also refers to Israel as the “fig tree nation,” when there is no biblical reason to do that. When Jesus spoke of the fig tree in Matthew 24:32, He was simply providing an object lesson from nature referring to times of the seasons in general, but He was not connecting Israel with the fig tree. Jesus was speaking of one of the ways people determine the different seasons of the year. When the leaves start to appear on certain fig trees in Israel, summer is approaching. We do the same thing. When we see leaves start to fall from trees, we know that fall and then winter is on the way. It’s that simple. Jesus finished up His object lesson in the next verse, Matthew 24:33. What “things” is Jesus referring to here? The things He had spent time discussing with the disciples that would signal the end of the age was here and they were varied (read all of Matthew 24). All those signs together lead up to His physical return. To the uninitiated, Dewey’s timeline appears to make sense. But most Bible scholars believe that the command to rebuild Jerusalem was issued by Artaxerxes during the time of Nehemiah and Ezra (in 445 BC). Historically, this is when the wall and the city began to take shape from the ruins it had been previously left in. I’ve included the chart I made to show how this works. Bruton believes the command to rebuild was when the UN issued their decree in 1947, so naturally, he starts counting the “weeks” from that point. Unfortunately, because he starts off with the wrong date, he naturally ends up on the wrong day, but you can’t tell him or his followers that because to them, he is correct, even when he’s wrong (note Jesus did not return yesterday). Beyond this, he makes the mistake of teaching that the 70 “weeks” is 70 years. This is clearly not the case if we understand the context of Daniel 9 alone. The “weeks” is referring to “sevens” or periods of seven years. The total of 70 “weeks” then is not 70 years, but 490 years (70 x 7). But Dewey makes the same mistake others make when it comes to Daniel 9. 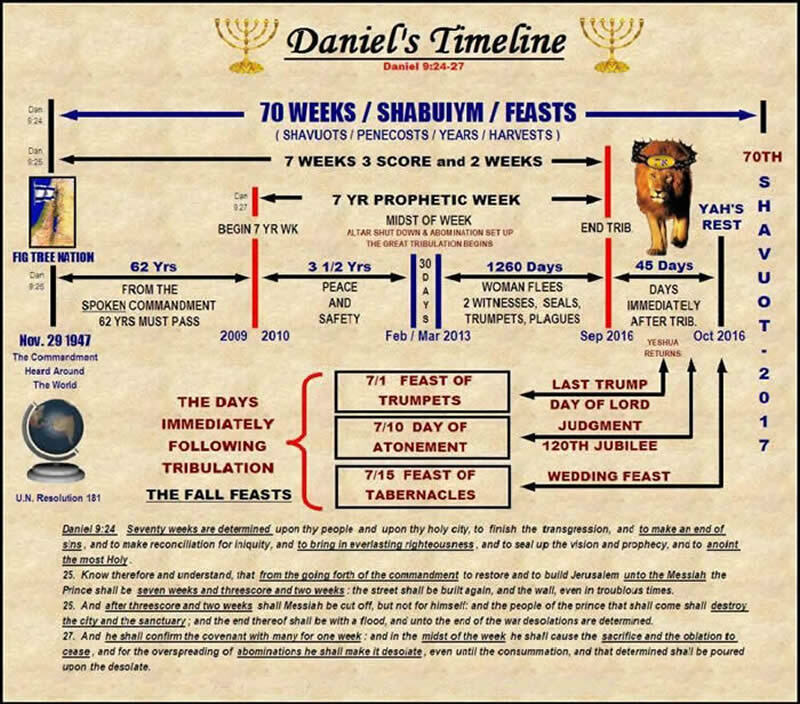 A chart I created based on the facts of Scripture related to the timeline of Daniel’s 70 “weeks” (“sevens”). Dewey also completely ignores the “gap” between the second group of “sevens” (62) and the final “seven” (or “week”). So according to Dewey’s own chart, Jesus was supposed to have returned already and we should now be enjoying the “Wedding Feast” of the Church! Not only that, but he has it clearly marked on his chart that the Wedding Feast of the Church occurs after the terrible days of the Tribulation. In other words, according to Dewey, the Tribulation is over, Jesus has returned, and we are now getting ready for the Millennial Kingdom of Jesus to begin. Look at the chart he has created as he has included months of 2016 along with the year. There is no mistaking it, folks. The problems are many. I don’t see Jesus, do you? I have received no notice of the upcoming Wedding Feast, have you? I do not see Jesus making any preparations for His Millennial Kingdom, do you? It’s absurd and I wonder how many people are still following after Dewey Bruton now? Some might think saying he’s a false prophet is going too far, but Bruton is the one who predicted the actual return of Jesus. Since he predicted it and it failed to materialize, then doesn’t that make him a false prophet? He “prophesied” and was clearly wrong. But if you don’t feel comfortable calling him a false prophet, then can we at least agree he’s a terribly flawed teacher? Clearly, his method for determining dates and events did not pan out. Neither have the predictions of Steve Fletcher….or Harold Camping. As I’ve said before in articles about Steve Fletcher (and Ronald Weinland), we need to be in prayer for these individuals and the people who chase after them with itching ears. People seem to have little to no ability to apply critically thinking skills to what they hear anymore. They have put their trust in teachers with questionable ability to rightly divide God’s Word for them. Entry filed under: Atheism and religion, christianity, Cultural Marxism, Demonic, Emotional virtue, eternity, Global Elite, israel, Judaism, Life in America, Maitreya, new age movement, Political Correctness, Politically Correct, Politics, Pretribulational Rapture, Religious - Christian - End Times, Religious - Christian - Prophecy, Religious - Christian - Theology, salvation, second coming. Tags: 70 sevens, 70 weeks, daniel's 70 weeks, daniel's timeline, dewey bruton, end times false prophets, eschatology, harold camping, steve fletcher. The one thing people manage not to mention. God specifically names the prophets in the OT. Our God was, is, and is to come. Since God specifically names the prophets of old in God’s Word, don’t you think if he had chosen prophets for the future, He would have named them specifically in the NT? Therefore, in my view, and believe me I have been fooled as well, all these so-called prophets of today are false prophets. If we stay in the Word of God, He gives us the information we need. We need to trust His Word. Therefore, watch, listen and hear what the Bible says, and be ready for His coming in the Rapture first. To me, this is most IMPORTANT. BEWARE of Satan in these last days. Many will be deceived, even the elite. Pray and stay close to God’s Word. I couldn’t agree more. The other thing to consider is that these “prophets” – whether they think so are not – are ADDING to God’s Word with their “prophecies” though they do not think of it that way. I also think people tend to make too much out of the end times timeline. As you say, we need to stay in the Word and too many go well beyond it dabbling in vain imaginings. If God wanted us to know ALL the specific details, He would have told us in His Word. Jesus clearly said that no one not even angels know the start of the end time until the unknown but imminent date of the next event, the Rapture of all true believers, to be follwed by the 7 year Tribulation. So let’s just disregard the blabbering of our current crop of false prophets and toss them over a figurative cliff. Furthermore, while study of and pre occupation with biblical end time scenario and prophecies appear commendable, I personally prefer to focus on planting salvation seeds in the potentially very short remaining time before the Rapture to rescue of few more lukewarm christians and unbelievers who will be left behind and experience unprecedented suffering including martyrdom, if choosing to become tribulation saints. It is simply a question of obeying and prioritizing the Lord’s divine command rather than focusing on uncontrollable and often unknowable future events that we as believers will more perfectly understand when we get to heaven. Thank you – yes! This preoccupation with having to know the exact times of end times events is off-putting. It is enough to know a general outline as presented in His Word to help keep us looking up. But as you say, it is far more important to fulfill the Great Commission – not just introducing the lost to Jesus but making disciples of them and teaching them what they need to know to live the Christian life now AND to get them involved in evangelizing others who are still lost.